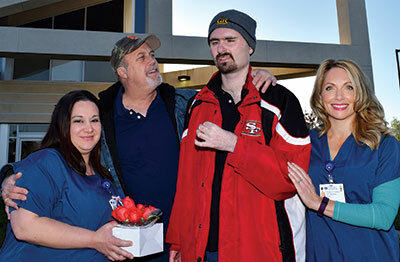 Mark Nelson (center) puts a comforting arm around his nephew Jonathan as the pair pays a visit to the NorthBay Surgery Center in Vacaville to thank NorthBay nurses Holly Green (left) and Elizabeth Scott-Paulsen. When a special needs patient needs dental surgery, it can be a bit of an ordeal. Just ask Mark Nelson, of Santa Rosa, who has taken care of his nephew, Jonathan, since he was 3 years old. A previous experience at another facility was pretty much a disaster, he said. But when he and Jonathan, now 29, arrived at the NorthBay Surgery Center in Vacaville, it was a very different experience. Not only was the greeting warm and friendly, Jonathan was immediately put at ease by the nursing team of Elizabeth Scott-Paulsen, R.N., and Holly Green, R.N. In addition to hospital dentistry in Vacaville and Antioch, Dr. McGinley has a private practice in Pittsburg and Rodeo. She and her partner, Dr. Rodney Bughao, travel to Vacaville a few times each month to serve special needs patents in this area. “Many of our patients are not able to verbalize their pain, if they are having any,” explained Dr. McGinley. “This is why it is so important that we see them regularly to maintain their oral health and keep them from experiencing dental pain. Even after the procedure was finished, the ease of care continued with Brittany Thompson, R.N. making Jonathon comfortable as he was coming out of the anesthesia. To back up his words, he sent bouquets to the nurses on the team, and offered his heartfelt thanks. He also made a big impression on Dr. McGinley.